Industries Fear Ripple Effect of Proposed Postal Cuts « Adafruit Industries – Makers, hackers, artists, designers and engineers! 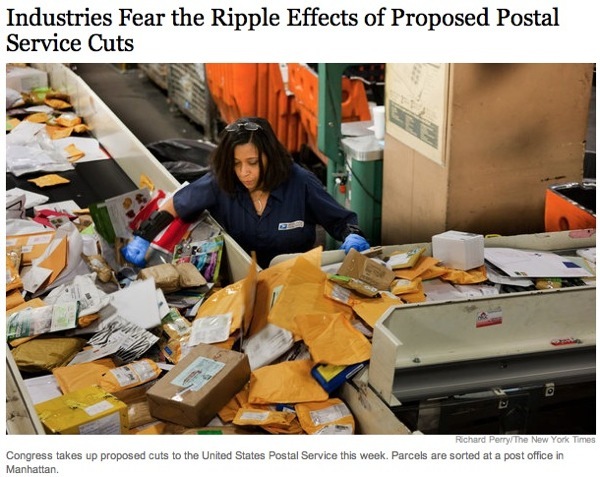 Industries Fear Ripple Effect of Proposed Postal Cuts – NYTimes.com. The service is the backbone of a mailing and shipping industry that employs more than 8.5 million people and supports almost $1 trillion in economic activity every year. The service itself employs 574,000 people. Nearly every business relies on the post office to deliver packages, advertise services and send out bills. This postal supply chain supports millions of American jobs in fields as diverse as banking, agriculture, media and manufacturing. Plus expect UPS and Fedex prices to go up. The post office has been the only way we’ve been able to keep them in check. You know, I TRY to feel sorry for the post office. But then I look at the sheer volume of Junk Mail that we receive, and it seems pretty clear that there’s something fundamentally wrong with their business model, or something. “We’re going to find all the people utilizing our service to make money, and charge them less than everyone else!” ?? Now I don’t live in the USA, but it is pretty obvious that the usps really hasn’t moved with the times. Keeping hundreds of mail sorting centers open is just burning cash, compare to fedex which have like 5. Also in Aust the postal service branched out, they sold office products, allowed you to pay bills register your car, etc. Maybe this could be something for the usps to look at ? I love USPS – I ship every day, and use USPS almost exclusively. Junk mail? I don’t get any really. Plus USPS is making money on all that junk mail. Why do I love USPS so much? Well, take a simple #00 bubble mailer. I can get that in the mail the same day, and have it delivered, with tracking and confirmation in about 2-3 days – with free Saturday delivery. Oh, and for residential adresses they get it in the afternoon. Not 7pm like UPS or FedEx – Cost? About $1.68. What would UPS charge? Something like $20. My customers love it when they order something on a friday, and it’s in their hands monday afternoon. There are hundreds, if not thousands of things I can buy on eBay for $1, including free shipping. Certainly the fact that China can ship something to me for $1 that costs me twice as much or more to ship within the US has something to do with why the USPS is going under? It’s probably something obvious that is lost on my simple mine (trade deficit?) but this has always confounded me.